Tiny, densely populated Utrecht is the Netherlands’ smallest province. 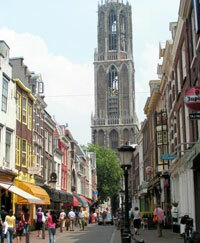 But its capital, also called Utrecht, is the country’s fourth largest city. Other prominent cities and municipalities in the province are Amersfoort, the birthplace of Mondriaan and a historic city that retains much of its medieval charm in its churches, museums, homes, city walls and gates, and Lopik, a municipality known for its TV and radio broadcasting facilities, including the Gerbrandytoren, the largest tower in Western Europe. There is a range of hills in the eastern part of Utrecht, an unusual sight in the mostly flat country. The municipality of Utrechtse Heuvelrug is included in this area. It was formed in 2006 and is named after the ridge of hills in the area. A national park covers almost half of its land area, and eight small towns fill out the rest. In the north are large lakes, popular for recreation and tourism. The river Eem winds through the region to the Gelderse Valley, an area mostly covered by forests and moorlands. The Vecht and Loosdrecht lake area has great natural beauty, and popular with locals and tourists for ice skating in the winter and swimming, sailing and windsurfing for the rest of the year. The Lopikerwaard area by the Hollandse IJssel River is a region of large polders, with meadows and farmland separated by narrow canals. It is also known for its cheeses. Utrecht’s central location makes it easily accessible by train, tram, bus and car from Amsterdam, The Hague, and other parts of the Netherlands. The central hub of the national rail network is in the provincial capital, Utrecht. The city of Utrecht has a lot of history. It dates back to Roman times, and it was the Union of Utrecht in 1579 that made official the resistance of the northern provinces against Spanish rule. Today, Utrecht’s past is still evident in its streets, canals and historic houses, and its modern, cosmopolitan character is reflected in the abundance of galleries, theatres, and museums. The University of Utrecht is the largest university in the country and rated one of the best schools in Europe. Utrecht's canals and wharves were vital to the city's trade and commerce for hundreds of years. 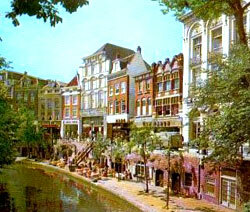 Today, city life still revolves around these waterways, especially the Oudegracht (Old Canal). Restaurants, cafes, markets are active day and night here. The city continues to expand. The Leidsche Rijn is a new neighbourhood scheduled to be finished in 2025, though some of its areas are already occupied. But in forging ahead to the future, Utrecht unearthed some more of its past: Roman ships and watchtowers were recently dug up around the construction area.